We all know it’s coming…just a question of when and how bad. Most experts predict it is still a few years off, but you still need to be prepared. While we can’t predict the future, we can look to the past to get a glimpse of what may happen. Because I’ve been getting this question a lot lately, I decided to dig in for you all. Corelogic, a world leader in information intelligence for the housing and financial industry, recently wrote a report on the National Housing Market since the Great Recession. I think Tennessee fared better because we did not have a huge run up in price before the last recession. Some places around the country were seeing 50% appreciation year over year. Not only is that not sustainable, but it sets the market up for a big crash when the smoke clears and the hysteria wanes. My best guess is that will hold true when the next downturn hits. And the accolades go on and on. 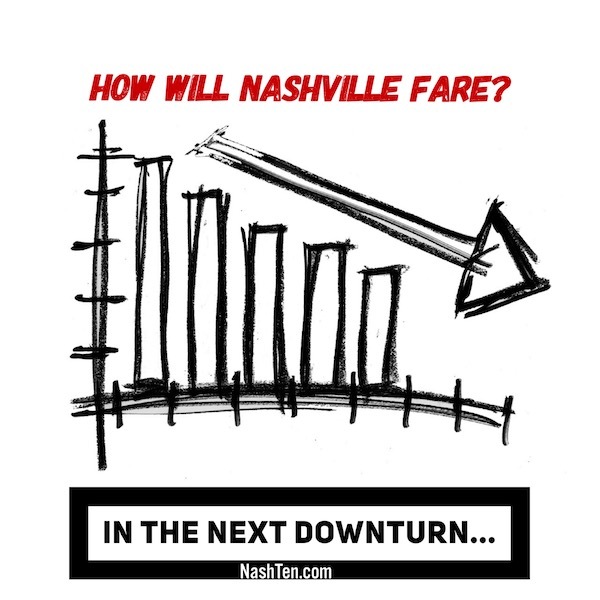 While the national economy is always in the back of my mind, I feel that Nashville is uniquely positioned to weather any storm and come out stronger. If you want a copy of this Corelogic report, just hit reply and I’ll send it to you. The Daily Deal in Nashville is this renovated bungalow in Eastwood Neighbors [East Nashville] that is listed for less than $400,000.